Lexmark's Platinum Pro905 color inkjet multifunction printer is a well-equipped, competent small-office multifuntion printer (MFP) with a twist: Users can access and view Web-based applications on its large, touchscreen LCD. Though few applications are currently available, the concept has potential. Comparisons to HP's Photosmart Premium Touchsmart Web ( ) are inevitable, but HP places a greater emphasis on prefabricated apps for consumers, while Lexmark expects its business users to build their own. The Pro905 can also be compared to Epson's Artisan 810 ( ), another MFP with wireless capabilities, but it lacks Web-based applications. The Web capability is just one aspect of what Lexmark calls SmartSolutions, namely the ability to program a button on the device's 4.3-inch display for walk-up, one-touch execution of a sequence of actions (such as saving scanned PDFs to a specific location on a server). Though the unit includes a few presets, the idea is for you to design sequences for your needs. The SmartSolutions interface for doing so works pretty well, but more hand-holding is needed as you ramped up. In addition, the SmartSolutions documentation could be more thorough, as well as easier to find. The Web presets include the ability to view an RSS feed of your choice, as well as to view and print an agenda from your personal Google calendar. You can even punch in your zip code and then map and print the closest sources of replacement Lexmark ink. 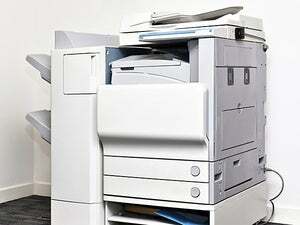 Lexmark says it is working on a software development kit, too. Note that Web access works only if the MFP is installed as part of an ethernet or wireless network, not over a USB connection. Installing Lexmark’s software driver is simple and during the setup, you will be prompted to determine if you want to print from your printer via a USB cable or wirelessly, through a network. Although setting up and printing wirelessly comes relatively easy with this printer, scanning proved to be a pain. Oftentimes the Pro905 would be unable to connect wirelessly with our Mac—an error message saying that it could not download a scan application list from our computer would appear. During the rare and random instances when it did retrieve the scan application list, you were given the option to scan your images to a multitude of applications like iPhoto, Preview, and Photoshop. 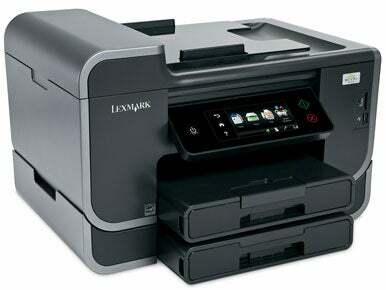 Furthermore, the Lexmark All-in-One Series Center software )when it isn’t busy crashing and quitting unexpectedly) allows you to control scanning options from your computer, like changing the resolution of your image. Be aware though that scan settings you input directly from the Lexmark will override the settings you set up from the computer. During times of inactivity, the Pro905's display will show recent news titles relevant to topics of your choosing, like MSNBC sports headlines. There are also “eco-friendly” options that are offered, like having the printer automatically turn off after 10-minutes of being idle, dimming the screen, and double sided printing. Through a USB connection, printing a one-page text document took about 25 seconds, and a 10-page word document took an average of 2 minutes, 34 seconds. Printing a four-page colored PDF file averaged out to around a minute and 20 seconds. The quality of the text documents was decent, but we were a little disappointed with the color documents, which came out a bit duller than the actual image, and the photo images the Pro905 printed were quite grainy. The MFP is appropriately equipped for its business audience, including two 150-sheet, letter/legal stacked input trays. The top tray can fit snapshot-size photo paper, while the bottom tray is removable when you need to save on space. You also get a 50-page automatic document feeder and an automatic duplexer. The somewhat flimsy, 50-sheet output tray slides out from the cover of the top input tray, and can get in the way during paper refills. Furthermore, because the tray’s last few inches folds up at a straight angle, only legal-sized paper can neatly fall on it after going through the printer. Media slots accommodate MultiMediaCard, Memory Stick, SD Card, and XD-Picture Card; the unit also has a PictBridge port. Lexmark covers the Platinum Pro905 with a five-year parts and labor warranty as long as you register the MFP within 90 days of purchase. Despite the wireless scanning kinks, Lexmark's Platinum Pro905 offers two good things for any small office: lots of paper handling and cheap ink. These attributes somewhat make up for the device's middling speed and print quality. Consider this MFP if you're intrigued by the SmartSolutions capabilities, especially the Web access—and if you have the resources to learn your way around them. With some patience and a sense of adventure, you could create some useful apps to make your work life easier.